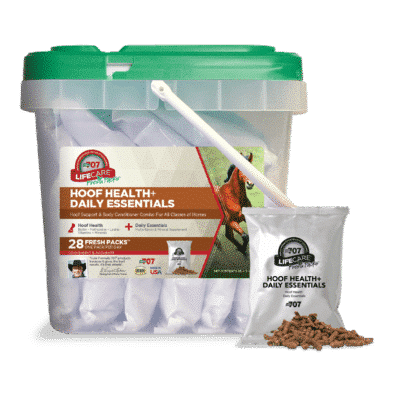 Formula 707® LifeCare® Hoof Health + Daily Essentials is now available in Daily Fresh Packs®! The perfect combination to provide unsurpassed care for your horse’s hooves and support superior overall condition. Includes D-Biotin (a B vitamin) to support thick, strong hoof walls and soles, and essential amino acids vital for overall hoof quality, and 12 vitamins and 11 minerals to support complete wellness. Accurate, pre-measured packs are convenient and easy to use. Combo Fresh Packs® are sealed to keep out oxygen, moisture and sunlight, and are convenient for traveling, events and daily use in your feeding regimen.